This article has been written initialy on Twivi.com. After have explained you how we do our pages, I wanted to show a particular case in which there's a lot of changes. For you, I choosed a page quite complicated, which has been done in many steps. So he sent, in a draft, some frames added to show with more details the action. Note that in the previous page we see the heroes in the small ship. It really seemed to me that the two first frames didn't bring anything new. 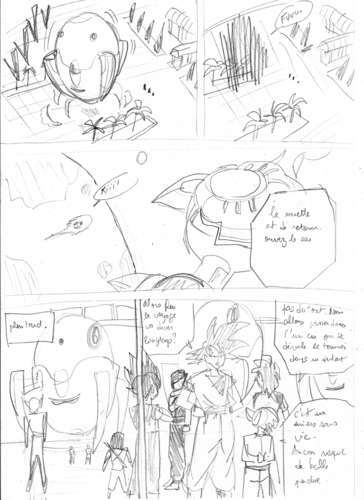 However, on the following double page, we had graph one or two frames with the ship teleporting itself in the other univers, and it still didn't fit at all. I wanted that we could only see the big frame with the combat field. So I skipped the upper frames and shift the others. 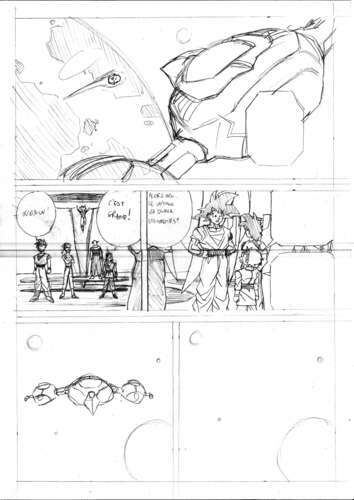 At the bottom, I copied the frame that he putted on the draft of the following page. I also left instructions to be able to do the teleportation on computer myself. The resulting draft is perfect. 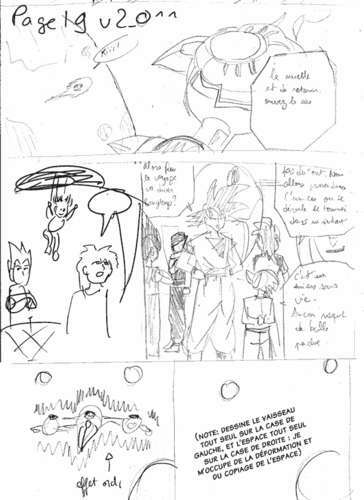 As asked, Gogeta Jr draw the ship and space separately, which permits me to paste easily one on the other and make it disappear slowly. View to the different possibilities, an idea came out of my brain : Why only two frames?